With the heavy rains we’ve had many gardeners are facing gardens or lawns that have been inundated or covered with “dirt” washed down from higher areas. Because floodwaters from rising creeks and rivers can carry debris and contaminants from upstream, many people may need to deal with more than just eroded soil and require professional help! The following ideas are some suggestions as to how a gardener can handle recovery from minor damage. Wet soil compacts easily. After it has dried a bit, start by picking up the debris-rocks, sticks, and trash. Perhaps you can use some of the rocky material to fill in low or eroded areas in walkways or other rough places. In the garden area, consider that good loam consists of a mix of sand, silt, clay and humus so look on this as an opportunity to improve your garden’s soil. Try to remove the rocks and gravel, leaving only a few inches of “new” soil if you can. Spread that evenly before tilling it in. Go deep to break up any hardpan and then take soil samples to see what nutrients you’ll need to restore. 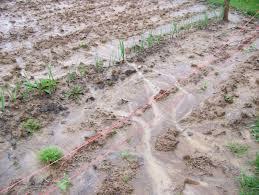 Send in a soil sample for analysis and plant a cover crop to hold your garden over the winter. Next spring, follow the recommendations from the soil test to incorporate lime, or nutrients, and add more humus in some form. You can expect to find that some weed seeds have come in with the deluge, so keep your eyes open for any seedlings you don’t recognize. If you do suspect chemical contamination because of an old house or a machine storage shed uphill, make a bioassay by planting bean seeds in pots containing the questionable soil and compare their growth with others you plant in pots containing regular potting soil. If the plants in the garden soil do not grow normally, you may need to maintain a cover crop over the garden next year and wait for the contaminants to break down. Before using a suspicious area for vegetables it would be well to have a commercial lab test the soil and the plants to identify the cause and suggest steps for remediation. Several are listed n the phone book.